After her label Jahnkoy's rambunctious spring 2019 show, designer Maria Kazakova — who's recently taken her brand's name as her own — spoke with a sense of urgency. "We have to restore and protect traditional craftsmanship," the 2017 LVMH Prize finalist asserted. 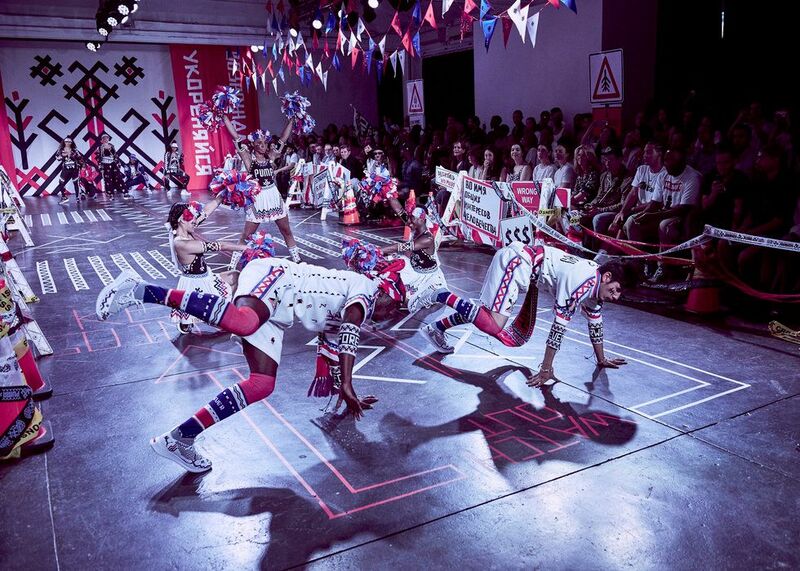 That mission statement, along with her vehement stance against global uniformity in dress guided DECEIVED: No More an energetic, three-part dance presentation composed by Brooklyn-based choreographer Nathan Trice. The performance opens with a group of city slickers texting and engaging in superficial pleasantries as commercial slogans like the Stanley Steamers jingle, traffic noise, and subway announcements blared overhead. 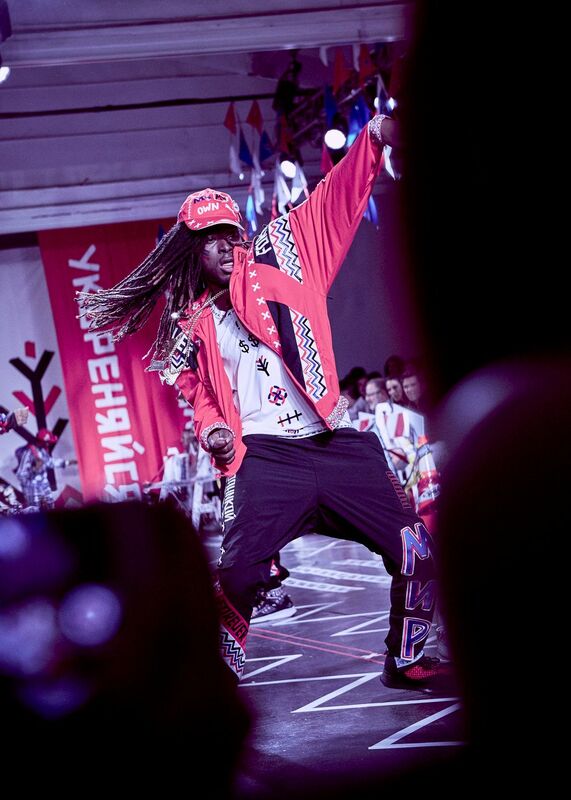 The crowd quickly devolves into chaos until it's unified by a group that the designer calls the "Jahnkoy army" — a tribe that spreads its cultural consciousness to the masses, restoring value for tradition. In closing, a lost culture — whose heritage is seen by modern people as a distant memory — emerges to reconstruct and heal society. Fortunately, the clothes weren't lost in the theatrics. 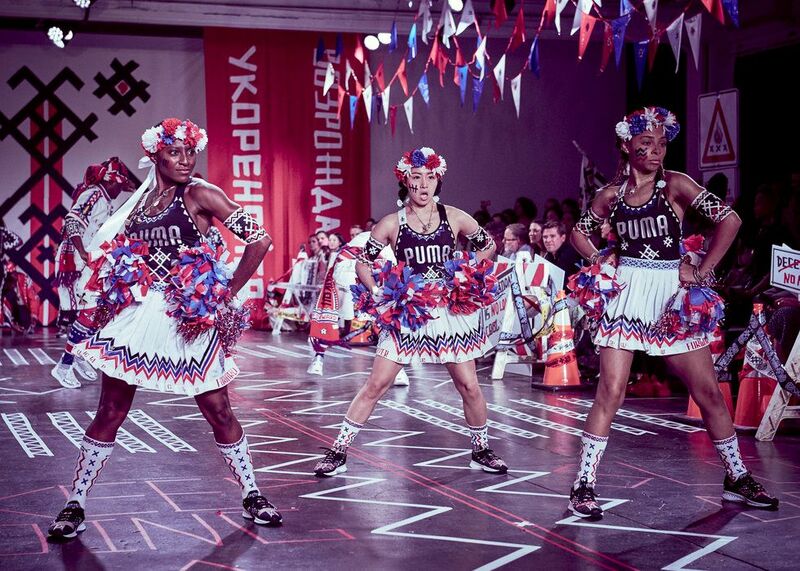 Separates rooted in athleticwear including cheerleading and basketball uniforms, tracksuits, and jerseys were shown alongside kokoshnik fascinators and pinafore style dresses reminiscent of Russian folk sarafans. "It's about a global sense of craft," Jahnkoy explained of the symbols and embellishments that cover the aforementioned silhouettes. "The symbols I've taken from Russian culture are also seen around the world." One of the prominent emblems seen in the collection is a red square enclosed by a three-row grid. "In craft traditions the red represents a soul and the lines around it represent Mother Earth, protection, and healing," Jahnkoy says. While garments are primarily used to protect our mortal bodies, Jahnkoy's are an expression of our spiritual connection with dressing. This inherently human message of harmony, individuality, and connectivity is powerful one for Jahnkoy to present in these troubling times. "These are the values I want to put forward in my work," she says. "I want to celebrate creativity that comes out from the core of human beings."